Is there a rework of the Conqueror Rune? Is the Keystone Rune Conqueror facing a rework? Big changes have been made to it on the PBE server. Conqueror, one of the four Keystone runes in the Precision Tree, could experience major changes with Patch 9.4. With the recent update of the test server Riot Games adapted the mechanics of the rune. Currently, players in combat receive a stack for 3 seconds per second. With a maximum of four stacks, the next auto-attack against a champion will consume them, offering the user 6-35 additional attack damage. In addition, 20% of the total damage done to Champions will be converted to True Damage for that duration. 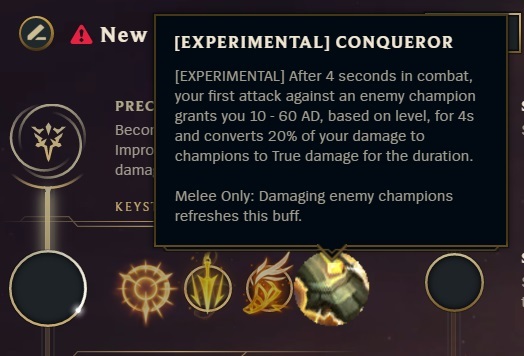 The latest version of Conqueror on the PBE server is reminiscent of the former Mastery Fervor of Battle. Auto-Attacks or spells that deal damage to opposing champions offer the player 3-15 Adaptive Force (for 3 seconds for Ranged, 8 seconds for melee). This effect can have up to five stacks. This equates to 3-15 AP or 1.8-9 AD per stack. When these five stacks are reached, the player heals for 10% of the damage done. Furthermore, 10% of the damage is converted to True Damage. Whether these changes will come in this form or at all with patch 9.4 is still unclear. From official side there were no statements to the Keystone rune so far. As always, changes made on the PBE server can still be customized or completely undone until the next patch.